Where is Chestertown Town Court Located? Chestertown Town Court is located at 6307 Route 9, PO Box, 486, in Chestertown, NY. The zip code is 12817. It is located in Warren County. This court receives a large number of moving violation tickets from the NYS Police due to the high volume of travelers driving along I-87. Interstate 87 is a north and southbound highway which stretches from New York City to Northern New York State. It passes through many different court jurisdictions and Chester Town is one of them. Along the stretch of highway that falls within Chester, it is easy to understand why drivers lose focus and exceed the speed limit. Many drivers are en route to long driving destinations and lose track of the speed restrictions. While Chestertown has many differ police agencies with jurisdictional powers to issue a speeding ticket returnable to their court, the majority of tickets are issued by the State Police in the G Troop. Other law enforcement agencies entitled to issue traffic tickets returnable to Chester Town include but are not limited to the Sheriff, Town Police, and State Park Police. The majority of speeding tickets are issued under NYS Vehicle Traffic Law 1180. There are other sections of law which overlap the VTL. These laws can include local law and Thruway Law. There is another court in New York with a similar name. There is a Chester Town Court located in Orange County. It is important to review all ticket information to ensure that your ticket is handled appropriately. Chester Town Court can also be referred to as Chester Justice Court. It is a court of local jurisdiction with limited power to adjudicate civil and criminal cases. It cannot hear cases involved dollar amounts greater than $3,000.00. It cannot hear cases under the Family Court Act or Federal Law. 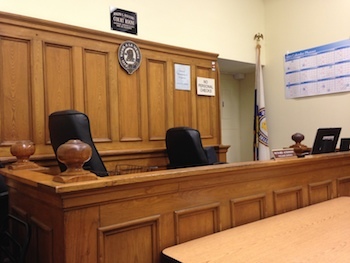 The majority of cases heard in this court are small claims civil cases and petty criminal matters such as reckless driving tickets, DWI, and harassment. Traffic tickets are prosecuted by the Warren County District Attorney’s Office. Although the prosecutor has the authority to tender an offer to resolve the ticket, it is up to the judge to accept to reject the proposed disposition. What if I Send my not Guilty Plea to the Wrong Court? Sending correspondence to the wrong court may be fatal to your case. A court does not have the responsibility to track down the appropriate court for which your speeding ticket was made returnable. If you fail to answer your summons, there are may adverse consequences that can be imposed. Most frequently, a court will suspended a driver’s privilege to drive. Driving with a suspended license is a crime. Depending on the severity, you can be charged with either a misdemeanor or a felony. Many driver’s who are pulled over for a traffic violation and are later found out to be driving with a suspended license will be arrested and have their cars impounded. What Happens if I Change my Address While my Ticket is Pending? Can a Misdemeanor Plea be Entered by Mail? For the most part, misdemeanors require a court appearance. The failure to appear in court can result in an arrest warrant being issued and additional charges being filed by the prosecutor. While it is rare, some courts can excuse a defendant’s appearance in court if they hire an attorney to represent them. Can a Traffic Ticket Plea be Entered by Mail? Yes. The option to respond by mail only applies to traffic summons. It is prudent strategy to respond by some method of return receipt. Although it is rare, some driver’s pleas have been lost and their licenses have been suspended. In such a circumstance, it is incumbent upon the driver to resolve the suspension. When a traffic ticket is resolved, the presiding judge has the authority to set a fine. The fine is based in New York law and administered in consideration of the facts and circumstances of the individual case. Our law firm has been fighting on behalf of drivers just like you. Every year we have helped hundreds of drivers reduce their exposure to points on their license, fines, and insurance increases. If you would like to save money, give our Watertown traffic ticket attorneys a call today at 800-893-9645.